Welcome to the new Blender Artists! 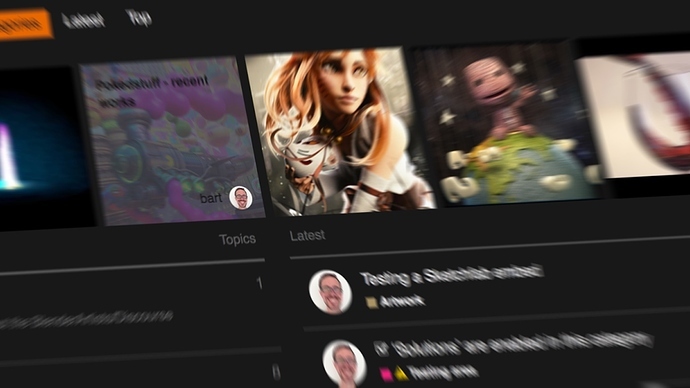 We’re super excited to welcome you to the updated Blender Artists forum! We’ve worked hard to copy over as much as possible from the old platform, and you should be able to log in with your existing password and join the conversation straight away. Any subscriptions you had to topics were not migrated, sorry! To learn how to set them up again, read our subscriptions migration guide. Despite extensive testing, you might run into some issues. If you find any problems, please check if it has already been reported in the site feedback forum and add your observations if necessary. If not, create a new topic. Please don’t double-post issues! 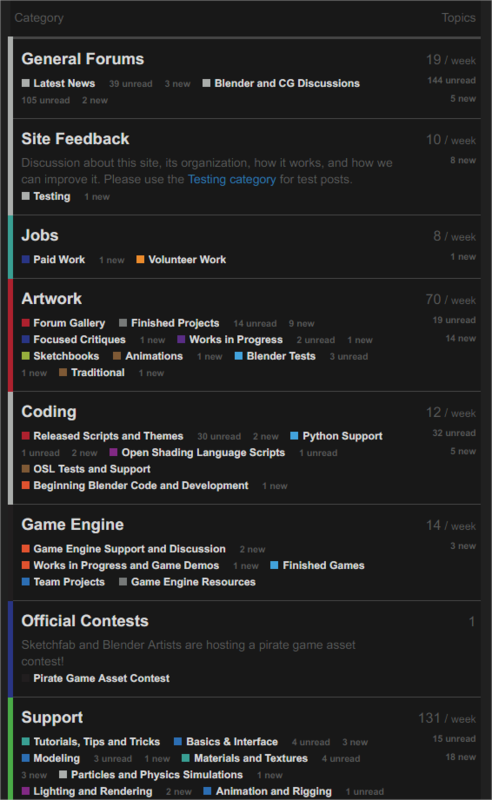 Design feedback is welcome in this forum too, but it will likely not be prioritized at this time. What are some cool new features? Do you prefer a dark or a light theme? We’ve got you covered! Click on the ‘hamburger’ menu at the top right and select your favourite theme. Add some media to your post? To add an image, just drag the file into the message composer. YouTube, Vimeo and Sketchfab are also supported - just add a URL on an empty line and it will turn into a player. Log in with your Blender ID! As long as the email address of your Blender ID matches your email address here, we’ll log you straight in. Why did we move to Discourse? Discourse is a ‘next generation’ forum system that uses many modern techniques to give a much better (and more fun) user experience than ‘traditional’ forums. It’s open source and developed by the people who created Stack Exchange. They bring a LOT of community experience to the table, and everything they do is focused on providing a better environment for conversations and community. I have been using Discourse for several years at Sketchfab and have fallen in love with it. The Blender Foundation is also using it as the new forum software for the developers community. Real time. New replies will automatically appear without reloading the page. Excellent notifications. 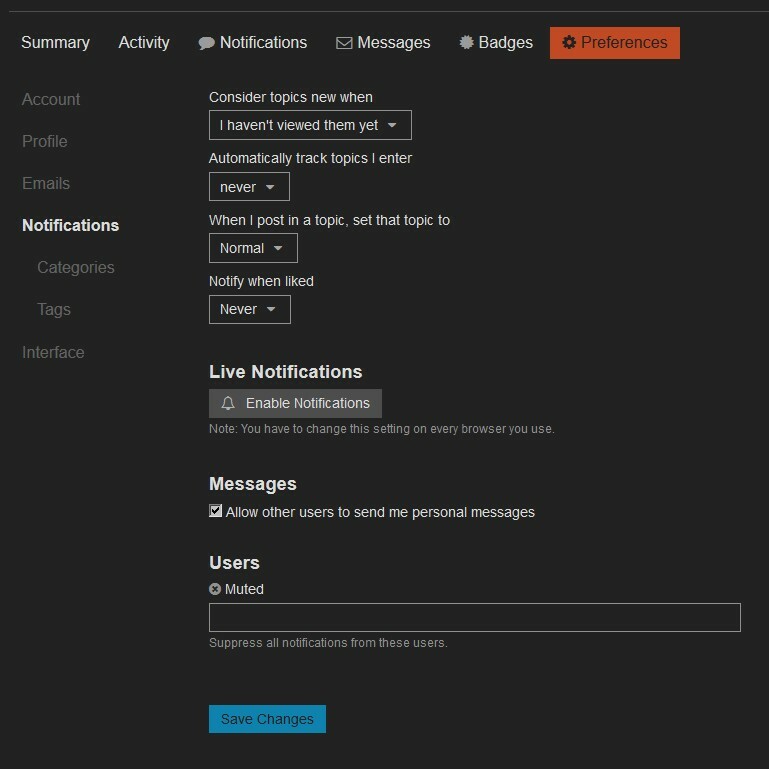 You can subscribe to topics and tags and decide the level of notifications you want to receive for each. Notifications are provided on-side (real-time, of course), as browser notifications (if you’re not on BlenderArtists you can still receive important messages), or through email. Discourse is smart enough not to email you if you’ve already visited the topic. Mobile device support. All features work great on your phone and tablet too. Editing posts. Discourse is based on MarkDown and provides a WYSIYWG editor with a live preview of your final layout. It also makes it much, much easier to embed other media. Just drag images into your post, or add a YouTube, Vimeo or Sketchfab link as you would on any other modern platform. Solved flag. Discourse lets the OP of a topic flag a reply as the solution of his request. This reply will be displayed at the top of the thread, making it easier for future readers to jump directly to the answer. With a clear ‘unsolved’ indicator in the topics list, this also makes it easier to identify which questions still need an answer. Badges! It may sound trivial, but badges can really help ‘document’ a person’s role in the community. Discourse can automatically award badges based on rules or queries, or they can be awarded manually. Good fun. Welcome to Blender Artists 2.0! Any way to remove suggested topics? Not as a user-selectable option. At some point, I can add a ‘minimalist’ theme that removes such things. What the crap is this? I have been here for years and now I get a beginner’s badge??? Unfortunately the Discourse user level system is not compatible with vBulletin. I’m sure you’ll level up quickly - Discourse looks at how often you visit the site and how you engage with others. Could be great to have a theme without things like “users” column, so many icons,… the discourse theme is like iOS or android, but with a lot of information that made really hard to read the forum, at least for me. Hmm, can’t say I like the look of this over the traditional forum. Like starting back at square one and the format for me seems to use a lot of wasted space. I suppose it’s all the rage now to have a “conversation” style layout, just like messenger / WhatsApp et al. “Interactive” though means I’d wager there will be more “noise”. For example, if somebody know how to read it properly, tell me your secret. Edit: I must to tell that the forum in an iPad Pro looks great, the book proportions and HD display improve a lot the experience. I can’t seem to find the «subscription migration guide». I still don’t know very well how to navigate the new site. Sorry I still have to publish it. Is now possible to Deactivate Account? With an extension like Stylebot you can make any change you like. Sure thing. I can anonymise your account if you like. Not the same, but thanks anyway. I was wondering too about those colors? - They seem so randomly assigned. The way I understand it, most Discourse forums don’t have quite the same kind of deep category/sub-category structure that we have (based on what was in the vBulletin forums). So the migration looks like a bit of a mess. Down the road, once everything settles out, maybe some minor reorganization of the categories can help tamp down on the visual noise a bit. They are, I haven’t spent time on them. We need to decide on a coding system that makes sense. Down the road, once everything settles out, maybe some minor reorganization of the categories can help tamp down on the visual noise a bit. I definitely think that using less categories and relying more on tagging is the way to go, but we’ll see how this pans out. How to mark all as read? BTW… Stylish is to customize themes with FF.